This topic is like the Suggest a ++ Class. You may suggest an enemy/boss you wish to see in FFL. I agree, gilgamesh would be nice. BTW, nice icon. Thanks. He's definatly should be in, I didn't make him just so he can't be used, he was hell to make. First I'd like to support the god which is Gilgamesh. Secondly, I think that each of the game's summons should be included as enemies as well, in a gauntlet style area (a "Summoner's Challenge" if you will). Why not add in bosses like Diablos, and I agree with the Gilgamesh boss. I would like the Mysterious girl and the Creator from ff4 After years to be added into the game. For skills she uses all black/white magic + summons. I was also wondering if the second moon can be added, but I feel that may not happen. It would be interesting though, but meh.. won't expect that idea to pass. Maybe to kill some extra time some of the summons could be optional bosses (Shiva, Ifrit, Ramuh, etc., etc.) as like a gauntlet kind of thing where they can get harder each round. 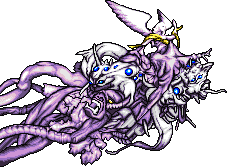 Of course it'd be at LoS and maybe even have Bahamut as the final challenge. And if not them, I second Chuck Norris. Punch - auto KO target. 100% chance of hit. Punch - auto KO target. 1% chance of hit. Hum...I'd like to see my ninja in it's full glory (OP Stats, Gemini Blade, and all) as an optional boss. The HP would have to be modified, and considering what attacks it has based on the Ninja commands, it'd have to be something similar to my own attack pattern. (/)Tremor -- Ninjutsu attack that works exactly like the original. Earth Damage w/ a chance of Petrify. Brief CT.
(/)Frost -- Ninjutsu attack that...yea. Ice damage w/ a chance of Hold. Brief CT.
(/)Image -- Adds the 'Blink' Status effect. Normal CT.
(/)Vanish -- A Ninjutsu of my own creation. Causes the enemy...me...to have the ability to briefly dodge magic attacks. May use after Image to increase survivability. Normal-ish CT. The stats of the enemy...me...would be similar to my original stats, which would be negotiable, of course. (My ninja's original stats are displayed in this thumbnail. Click to see the real version of it. As you may have noticed, the stats for attack power are high. Very, very high, considering most bosses generally don't score 1000 damage with a normal hit. However, his HP should be increased to ensure that it would be both a battle to remember and fear should you lack the power to defeat it outright. If you must, compensate some of the attack power to boost HP to a reasonable level for an optional, but difficult boss. 1. The Crystal Chamber in Mysidia/King Giott's Castle, in front of the altar. Would say "I hope you're ready for a challenge!" 2. Castle Eblan, hiding in one of the 'locked' treasure chests. Would say "Graaaaaah, that was a good nap! Now, after I stretch a bit, I'll show you why Naru calls me a super ninja!" After pressing .center, it would bring up the question "Attack Toru before he's ready?" (if no, Toru will then say, "Well, I'm ready, are you?" Yea, I know. A bit elaborate, but I thought that would be nice to have comic relief like that. 3. How's about that area in Abonia where only characters "level 99 and above" can enter? Replace the bartender with Toru, and when spoken to, says, "I got a job here as a bartender for the heck of it. So what? Wanna fight about it?" As a bonus, it'd be funny if he actually sold drinks after getting beaten. It'd be a nice touch, but I'm unsure how you would accomplish it. 4. Here's a unique choice I thought of. What if you placed Toru in an area accessible only by Ninjas, like the shops that sell shuriken. The only issue is...where would he be? I'd add a staircase in the Cave of Eblan using one of those currently useless secret passages. When talked to, it will say, "Another day, another challenger. What more could I ask for?" and the battle will proceed without a yay/nay box. 5. Wherever deemed appropriate. I know that sounds silly, but, hell, I ran out of ideas. Now, it boils down to a prize. You shouldn't gain any EXP and GP at this point of the game is fairly unimportant (Unless you're trying to get 99 MElixirs?). This should be a challenge for level 99 characters. I don't think this should be a repeatable boss, but that would, once again, depend upon the context. EDIT: By the way, I consider this a serious suggestion. Level 99s are funny like that. I was thinking of something like Zeromus' Soul or something as a boss. Optional of course. It could be simply a recolored Mind or Breath, and have those as guardians too. Same moves as Zeromus, but better stats. I think it would be a nice, fun fight. Wasn't that inspired by my mistake on the naming of one of said monsters. Hur. I think also he should be given an extra move or two. Maybe something like Dispel? So, I recently had three ideas for bosses. It's a boss that, unique so far to FFL, attacks with status effects. Poison, Hold, Countdown, Silence, Blind, etc. I know most of them work on players well, so why not impliment them? I think it would be a fun boss to try and kill. Yes, like from FF4: Advance. Each summon uses their main element to attack with, and even though its magic, since their summons, it shouldn't be affected by things like reflect, or blink in some cases like Titan, if he gets physical attacks. Yes, thats right, the main characters, our classes, from FF4. One on one? Nooo, that'd be too easy. I'm thinking two battles, one right after another, with 5 enemies. Team 1: Palom, Porom, Yang, Edward, and Cid. Palom and Porom could be using twin magic, or their own magic to heal/damage, Yang would be the main physical attacker to worry about, Edward buffs, and Cid does slow, but super damage. The second team would be, of course, Cecil, Kain, Rosa, Rydia, and Edge. Cecil would guard and attack, Kain should, of course, jump spam, Rosa would heal a lot, Rydia should use either Meteor, Flare, or Megaflare (Bahamut) and Edge should throw shurikens, use ninjutsu, or just use regular attacks. Those are my ideas, hope you like them.